Tea staff member Marjorie has her two children create dragon masks inspired by Korea. b. Markers, crayons, colored pencils, etc. 1. Download our Dragon outline from our Activity Book. 2. Using a projector, resize the image until the dragon head will fit your child’s head as a mask. 3. Print the mask and use markers, colored pencils, or paint to fill in the design. 4. Cut out the mask. Use a hole punch to put holes on each side of the mask. 5. Have your child hold the mask in front of the eyes. Tie the string on one hole and wrap it around the back of their head, resting the string on their ears and tie the other side of the string to the opposite hole. As your children are wearing their masks, snap a few pics and enter them in our “Around the World Activity Contest” for your chance to win one of our 10 weekly prizes and be entered into a sweepstakes to win a $500 Tea gift certificate. Contest ends 7/31/2012. Visit www.facebook.com/teacollection to enter. This activity was inspired by the Sejong Dragon Pant which first debuted in Destination: Korea in Spring 2010. Named for the king who invented the Korean written alphabet, these pants feature an embroidered dragon graphic on a cargo pant style. Looking to add a little spirit to a gloomy day? Look no further! You can make your own spirit stick. This activity is perfect for all ages and easy to create. Oh, and did we mention just how fun it is too? This activity is quite simple, perfect for the littlest of citizens. Simply decorate your stick with “Spirit.” Paint, glitter, markers, textiles or anything else you can find around the house looks great fastened to this stick. As your children are shaking their spirit sticks, snap a few pics and enter them in our “Around the World Activity Contest” for your chance to win one of our 10 weekly prizes and be entered into a sweepstakes to win a $500 Tea gift certificate. Contest ends 7/31/2012. Visit www.facebook.com/teacollection to enter. This activity was inspired by the Sanga Dress, which first debuted in Destination: West Africa in Spring 2008. The dotted swirl print is inspired by Mali motifs and hand dyed textiles. Who knew three Pima Cotton baby sweaters could launch a company? Emily and Leigh knew that this no fuss style would keep babies warm and stylish. For ten years, we’ve been traveling the world but still remain true to our roots with our Chinese Baby Sweater. Get your little one bundled up in style and see where the world takes this little citizen. Tea staff member Marjorie has her little citizen create a Japanese fan. 2. Pint the fan on thick cardstock paper. 3. Once printed, color in the graphic using colored pencils. 4. Use watercolors to paint in the background. 5. Once colored and painted, cut out the fan shape with your scissors. 6. Flip fan over and add a Popsicle stick to the backside using tape or glue. For added strength, use three Popsicle sticks and make a “Y” shape. While they’re crafting their fan, snap a few pics of your little citizen and enter them in our “Around the World Activity Contest” for your chance to win one of our 10 weekly prizes and be entered into a sweepstakes to win a $500 Tea gift certificate. Contest ends 7/31/2012. Visit www.facebook.com/teacollection to enter. This activity was inspired by the Butterfly Dot Dress, which first debuted in Destination: Japan in Fall 2009. The Japanese inspired print featuring a flurry of red butterflies on a field of blue dots has come back in a classic flutter sleeve silhouette. Look at how we have grown, back in 2002, Emily Meyer and Leigh Rawdon shared a common vision: a children’s clothing line inspired by different cultures. After 10 years of hard work and tremendous growth, Tea has blossomed into a family of 53 and counting. Tea Collection's first label for clothes in 2002. Evan, Tea's copywriter, has his daughter make her own paper. 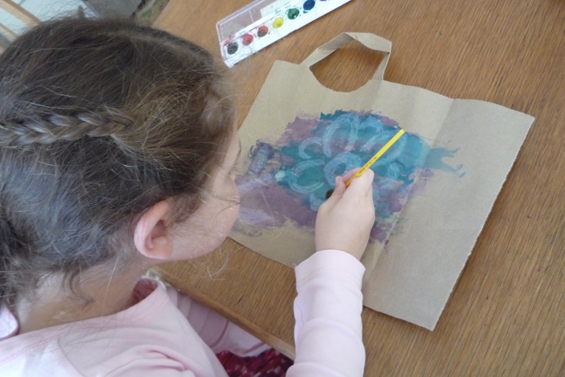 With just a few supplies and minimal direction, your little citizen can have fun crafting their own paper! Read on below for the easy step-by-step guide on creating paper. 1. Use your white crayon to draw whatever you would like on your paper. 2. Once you’re done drawing, paint over the crayon with watercolors to see your image appear. The finished product- pretty cool, huh? While they’re painting their paper, snap a few pics of your little citizen and enter them in our “Around the World Activity Contest” for your chance to win one of our 10 weekly prizes and be entered into a sweepstakes to win a $500 Tea gift certificate. Contest ends 7/31/2012. Visit www.facebook.com/teacollection to enter. This activity was inspired by the Hanji Floral dress which first debuted in Destination: Korea in Spring 2010. Inspired by handmade decorative Korean paper. We brought it back in its original printed poplin wrap style dress with side tie closure. Be an original! Esther, who works in Tea's marketing department, has her daughter demonstrate how to make candy sushi while modeling the Butterfly Dots Dress from Tea's anniversary collection. Is your little citizen a sushi addict? If so, they’ll love our sugary take on the hand rolls. This Japan-inspired activity isn’t only fun, it’s also delicious too! 1. Grease the 12×17 inch baking sheet. 2. Melt butter in 2-quart saucepan over medium heat. 3. Add marshmallows to the 2-quart saucepan and stir into butter until smooth. 4. Remove mixture from heat and stir in the rice cereal until it’s evenly coated. 5. Turn the baking sheet so that the shorter ends are at the top and bottom. Then press the marshmallow mixture on the sheet, distributing it evenly. 6. Starting at one side and one inch up from the lower edge of the mixture, place gummy worms atop the mixture end to end in a horizontal line. 7. Gently roll the lower edge of the marshmallow mixture over the gummy worms. 8. Then stop and cut the log away from the rest of the mixture. Use the same method for 4 more logs. 9. Slice each log in 1-inch-thick “sushi” rolls and wrap them individually with a strip of fruit leather. While making the candy sushi, snap a few pics of your little citizen baking and enter them in our “Around the World Activity Contest” for your chance to win one of our 10 weekly prizes and be entered into a sweepstakes to win a $500 Tea gift certificate. Contest ends 7/31/2012. Visit www.facebook.com/teacollection to enter. This activity was inspired by the Butterfly Dot Girls Dress which first debuted in Destination: Japan in Fall 2009. The Japanese inspired print featuring aflurry of red butterflies on a field of blue dots has come back in a classic flutter sleeve silhouette.